Mount Faber is a 106-meter hill situated beside Bukit Merah planning area in Singapore. Named after Captain Charles Edward Faber, it is the third highest hill found in Singapore, and it is covered by secondary forest growth. Providing an exquisite view of the Central Area panorama and other locations, the hill is a favorite stop for tourists. Mount Faber Park is one Singapore’s oldest parks and a must-see for visitors. It has several lookout points near the ridge that afford you wonderful views of the Lion City skyline. If you can, try to visit the park both in the daytime and in the nighttime so you can see the breathtaking views when the sun is up and when the city lights are aglow. 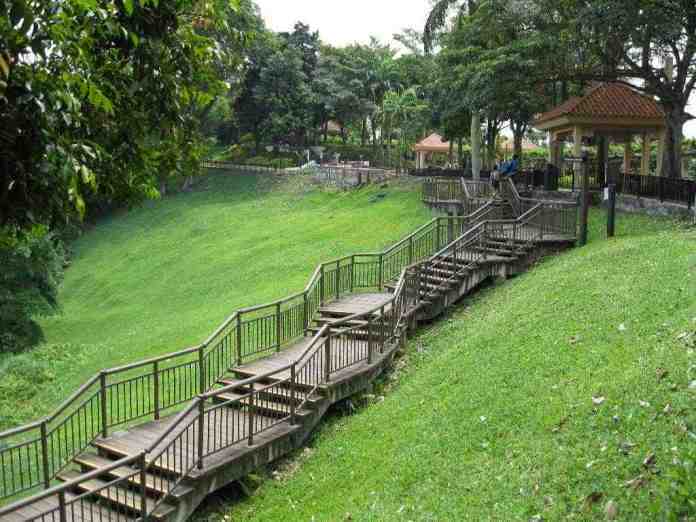 The park features an interesting mural at Upper Faber Point, which is the park’s highest point. The mural displays important scenes from Singapore’s history. At Mount Faber Park, you can go bird-watching, take a walk along the nature trail, snap pictures of beautiful sights, or simply relax on a bench while being enveloped by nature. One of the things that Mount Faber is known for is the Cable Car system linking it to Sentosa Island. It was built in 1974. However, it underwent a major overhaul in 2005 and was reopened as part of The Jewel Box, an elegant dining and relaxation complex that literally sits on the hilltop. The Jewel Box is a sight to behold especially at night when its magical lights make it look like a large piece of precious stone glittering in the dark. The Cable Car in Mount Faber is one of the things that tourists look forward to in Singapore. It is the first cable car system in the world that crosses a harbor. The Cable Car has gone through an enormous improvement to give its passengers more comfort. Its spacious interior can seat 8 people. The walls have large windows, and with the car’s transparent doors, you can have an amazing 360-degree view of the surroundings. The Cable Car operates daily from 8:45am to 10:00pm. The Jewel Box is perfect for those quiet romantic dinners. There are five restaurants in the complex, each uniquely designed to give it its own sparkle: the Emerald Lodge, the Sapphire, the Moonstone, the Black Opal, and the Empress Jane. The Emerald Lodge is an open-air restaurant that serves Italian and Western-Continental dishes. It is located on the hill’s upper terrace, just a few minutes walk from the Jewel Box. The dress code for guests is casual. It is open Fridays and Saturdays from 9:00am to 2:00am and Sundays to Thursdays from 9:00am to 11:00pm. The Sapphire faces the harbor and has both indoor and outdoor tables. It serves different kinds of international cuisine. Dress code for the Sapphire is smart casual. The Moonstone is an outdoor bar. Designed with candle-lit wooden tables, it blends perfectly with nature. The place is perfect for unwinding and relaxing under the stars. Dress code here is casual. The Black Opal is one of the more elegant restaurants in Mount Faber. Exuding an aristocratic appeal, it is encased in glass walls that give diners a wonderful view of lush greens with the harbor as a backdrop. Dress code here is smart casual. The Empress Jade is beautifully designed with arcs made of Hiba wood. It serves Cantonese cuisine. Dress code is also smart casual.